Will Coca-Cola Raise Its Dividend in 2017? The soft-drink giant has gone through some problems with its sugary carbonated beverages, but will that stop Coca-Cola from rewarding shareholders with higher dividends? One reason investors gravitate to dividend stocks is their reliability, and Coca-Cola (NYSE:KO) is a good example of how consistency can turn into strong long-term returns. Coca-Cola has a long track record of providing dividend growth to its shareholders, finding ways to boost its payouts even when the company has gone through difficult situations, and it has averaged more than 12% in annual returns to shareholders over the past half century. The soft-drink giant is facing some tough challenges right now as it tries to navigate the changing consumer preferences among its customers, but the question that shareholders have is whether that will stop Coca-Cola from continuing its impressive history of rising dividends. Let's look more closely at Coca-Cola to see whether investors can count on the Dow component to raise its dividend in 2017. 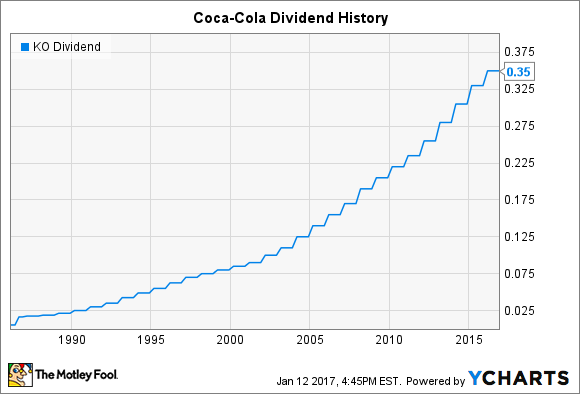 It's hard to find companies that have a longer history of dividend growth than Coca-Cola. The soft-drink giant hasn't made a big splash with the pace of that dividend growth, generally remaining satisfied with single-digit percentage dividend increases. Yet year in and year out, Coca-Cola's increases over the past 15 years have ranged from 6% to 11%, including the most recent increase that sent the payout from $0.33 per share on a quarterly basis to $0.35. Yet the problem for Coca-Cola investors is that earnings growth hasn't really kept up with those rising payouts, leading to a substantial increase in the company's payout ratio. Back in 2011, Coca-Cola paid out a total of $0.94 per share in split-adjusted dividends throughout the year. That compared favorably with diluted earnings of $1.85 per share, working out to a payout ratio of just over 50%. Since then, however, earnings have actually fallen gradually, and over the past 12 months, Coca-Cola has earned $1.65 per share. When you compare that to the $1.40 per share in total annual dividend payments, you get the nearly 85% payout ratio listed above. That has some dividend investors worried, despite Coca-Cola's long track record of dividend success. What ails Coca-Cola right now? The primary problem with Coca-Cola is that its namesake line of sugary carbonated beverages has fallen out of favor among customers, especially in its key North American market. Health advocates argue that soft drinks are partially responsible for the epidemic of obesity across the globe, and policymakers have looked at initiatives like adding taxes to soft drinks to discourage consumers from using them. In response, Coca-Cola has undergone a major transformation. By branching out further into areas like bottled water, tea, and juice as well as emphasizing sugar-free options and product reformulations in its sparkling offerings, the drink-maker thinks that it can successfully navigate the adverse environment for its former core products and use its diversified portfolio of beverage offerings to start growing earnings again. Investors are hopeful that Coca-Cola's efforts will be successful enough to boost income and support higher dividends. Currently, those following the stock expect nearly $2 per share in earnings in 2017, and that would support a typical high-single-digit percentage increase to $0.38 per share for the beverage giant. With a 54-year commitment to rising dividends, Coca-Cola won't willingly give up its status as a Dividend Aristocrat by failing to make it 55. Investors can expect an announcement in February with a higher payout. In the long run, though, Coca-Cola needs to find ways to bolster its bottom line if it expects its streak to keep going in the years to come.